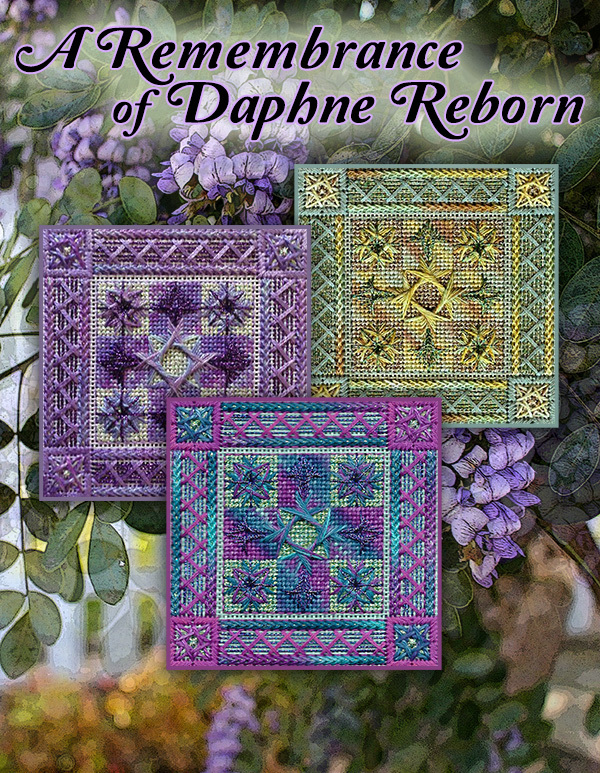 A Remembrance of Daphne Reborn is a small elegant design derived from elements of Michael’s Daphne and Arabella. The project can be finished in a variety of ways and the main design area makes a stunning ornament. It’s a great introduction to twisty stitches with lots of guidance for beginners and enough variety to satisfy the more experienced stitcher. Remembrance is approximately 5” square, and is worked on a 10” square piece of 18-ct. canvas. It features an assortment of threads: Caron Collection Watercolours and Wildflowers and Kreinik braids. Stitches used in the Remembrance design include: Sprats Head, Walneto, Milanese, Rice stitch variations, Scotch Squares variations, Rhodes stitches, Woven Cross, Milanese, Plaited stitch and more.